"... from so simple a beginning endless forms most beautiful and most wonderful have been, and are being evolved. " With these words Charles Darwin closes his own most beautiful and most wonderful book, "The Origin of Species". But Darwin's case for his theory of natural selection therein has its own simple beginning, and not one having to do with an ancient or exotic organism, but with the species Columba livia, the humble rock-pigeon, that unremarkable denizen of our urban landscape. I came to appreciate the importance of Columba livia to Darwin's argument only recently, as a result of undertaking a re-reading of "Origin" at the suggestion of Josh Gough, the organizer of the Atlanta Science Tavern Meetup. Although I was eager to re-familiarize myself with the famous text, to put it honestly, I wasn't looking forward to slogging my way through chapter 1, "Variation under Domestication", again. My interest in biology has always been with its most abstract concerns, so taxonomy, the naming, description and classification of animals and plants had never held much allure for me. But I had learned in the years since my first reading of "Origin" that Darwin's section on selection of domestic species, specifically pigeons, was crucial to the presentation of his greater theory. I was determined to understand why this was so, and I wanted to write about it. This is where Wikimedia Commons came to my rescue. In their own words, "Wikimedia Commons is a media file repository making available public domain and freely-licensed educational media content (images, sound and video clips) to all." To my good fortune, this repository contained a photo or illustration that was representative of each of the 10 or so domesticated pigeon breeds that Darwin mentions in his book. Their ready availability made this essay possible and the images themselves allowed me to see for the first time why the variation exhibited by these pigeon breeds was so central to Darwin's argument. To understand why the variation resulting from the domestication of pigeons was essential to Darwin's presentation of his theory of natural selection, one must fully appreciate the difficulty that Darwin faced in persuading his readers of the possibility that any ancestral population could generate, over time, individuals quite unlike themselves. How could it be that organisms as different as crocodiles and crocuses are related by common descent? Without recourse to knowledge of the mechanisms responsible for the modification and transmission of biological traits - much less a theory of genetics - why should anyone believe that living things possess the kind of intrinsic malleability that such enormous variation in form would demand? These breeds, so different from one another, provided Darwin with compelling evidence that the potential for evolutionary change was, in fact, present in a single species, Columba livia. The implication was that, if such variation could be achieved with pigeons by means of breeding choices over the course of human history, then, perhaps, it was not unreasonable to imagine that the enormous variety of the biological world could have been achieved by means of natural processes over the the vast expanse of geological time. For Darwin to make his case, though, it was not enough for him to demonstrate the striking variation in breeds of pigeon, he had to convince his readers that these breeds were, in fact, breeds of rock-pigeon, and not themselves each a descendant of a different "aboriginal" pigeon species. Darwin does this through several lines of argument. He speculates that is was improbable that "uncivilized man" had undertaken the domestication of so many different pigeon species; he notes the absence of existing wild populations of the hypothetical aboriginal types; he describes how crosses within each of the breeds exhibit markings of the proposed rock-pigeon ancestor; and, anticipating the modern definition of biospecies, he observes that the various pigeon breeds are capable of producing fertile "mongrel offspring". Finally Darwin concludes, "I can feel no doubt that all our domestic breeds have descended from Columba livia." Using these pigeons Darwin developed a plan in "Origin" to fend off the challenges faced by any scientific theory based, not upon reproducible experiment, but upon historical evidence. Variation under domestication was the closest thing Darwin had to a laboratory to "test" his ideas. He understood that this "experiment" with pigeons was the unassuming foothold he needed in his book before he could begin his ascent to his bold and comprehensive view of the origin of the range of living organisms. 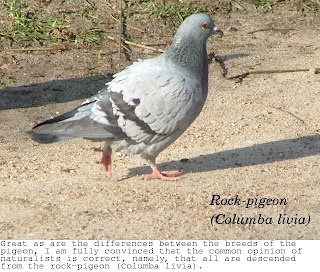 The highly-varied domestication of Columba livia was Darwin's simple beginning, and his theory evolution by natural selection was its beautiful and wonderful descendant. An Ode to Darwin's Pigeons and to Wikimedia Commons by Marc Merlin is licensed under a Creative Commons Attribution-Noncommercial-No Derivative Works 3.0 United States License.